In this Antique Lure gallery we spotlight the Heddon Lucky 13. The Heddon lucky 13 is infamous with antique lure collectors and fisherman alike. I cant tell you how many people I've met when discussing antique lures they bring up that they used to fish and or still fish with the Lucky 13. A great top water lure popular with striper, salmon, and bass fisherman alike. The Heddon Lucky 13 is series number 2500 for the regular size, and series 2400 for the Jr. The lure spanned the test of time and was made in some shape or fashion since the . The Lucky 13 lure was arisen out of the Wiggle King lure in the late teens. The Lucky 13 I believe was cataloged first in 1920, in a Red Border Heddon Dowagiac Down Bass Box. Story has it the Wiggler King was done away with due to the similarities and name confusion with the Creek Chub Wiggler. What ever reason it was, the Lucky was destined to be one of James Heddon's best selling lures. The Heddon Lucky 13 series 2500 is approximately 3 7/8" in length. 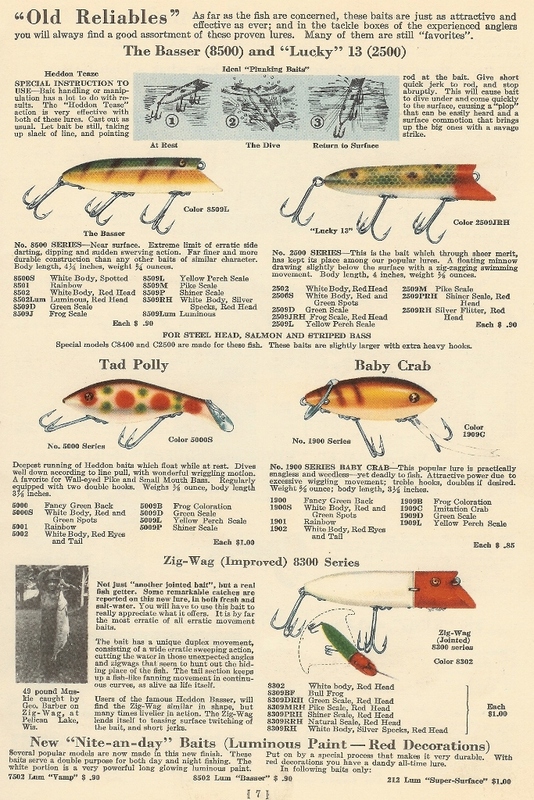 The lure due to its longevity was offered in quite a few configurations. First, the lure was offered in Cup Rig Hardware, with no Eyes and a elongated lower lip the lure is given the nick name "No Eye, Long Lip" by collectors. The Lucky 13 soon after moved with the rest of the Heddon lure line up to the L-Rig Hardware, and the elongated lower lip was shortened thought to give a better strength to the hook harness. The lure was offered in both regular and and heavy duty L Rig, mostly used for salmon and salt water fishing. The lure was offered in Toilet Seat (Both up turned and Regular), and Two piece Flap rig with and without eyes. The lure then was offered in a Surface rig hardware with tack eyes, and finally onto a plastic lure with painted eyes. There is also a Musky version of the lure that is larger and made with and without glass eyes, in a spook body. The lucky 13 was offered in all the boxes as well, from its initial down bass box, to the up bass box, into the HR Brush box and finally onto the Banner box. Model 2509J, Frog Scale, No Eye, Long Lip, L Rig. Model 2509R, Natural Scale, No Eye, Long Lip, Cup Rig. Model 2500, Bar Perch, No Eye, Cup Rig. Model 2509M, Pike Scale, No Eye, Long Lip, L Rig. Top: Rainbow Bottom: Blue Scale, No Eye, Long Lip , Cup Rig. Top: Gold Fish Scale Bottom: Red with Black Spots, No Eye, Long Lip. Top: L Rig, Bottom, Cup Rig. Top: Gold Fish Scale Bottom: Red Head Silver Scale, No Eye, Long Lip, Cup Rig. Transition Series between the Wiggle King and the Lucky 13, Dace in color, Painted Eyes, Cup Rig. Model 2509H, Red Scale, No Eye, Long Lip, Cup Rig, Shown with correct Down Leaping Bass Box. Model 2509SS, Strawberry Spot, No Eye, Long Lip, Toilet Seat Hardware. Top: Solid Yellow Bottom: Frog Spot, No Eye, Long Lip, Cup Rig Hardware. Strawberry Spot, No Eyes, Cup Rig, Shown with the Wiggle King introductory Box. Model 2500, Green Crackleback, Glass Eyes, Two piece Hardware.